While Asus is definitely not killing off the mainstream ZenFone family... just yet, the company does plan to release more gaming-oriented ROG Phone models in the near future, presumably aiming to help this niche appeal to a wider and wider audience. The first-generation Asus ROG Phone is already a pretty impressive all-around flagship device, as discovered in our recent in-depth review, but before spending a small fortune on this gaming beast, you may also want to know how badly you need to put a protective cover on it. If you’re worried about drops, you should definitely consider investing in a high-quality case, but scratches are unlikely to be a problem for that beautiful glass back. 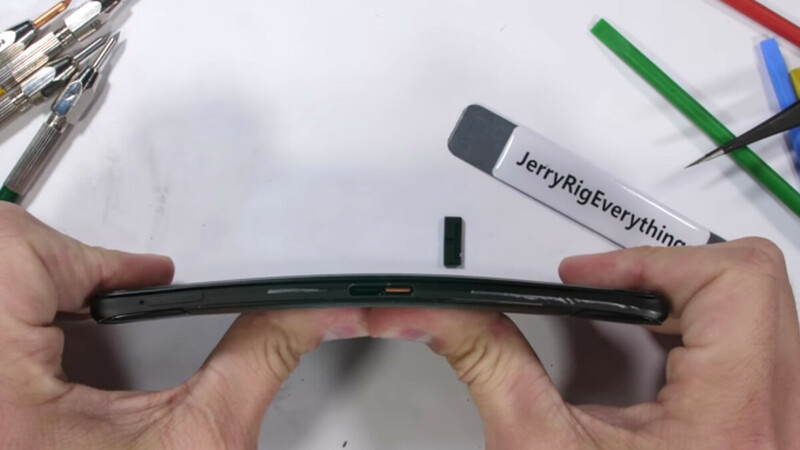 Professional smartphone torturer Zack Nelson from DIY YouTube channel JerryRigEverything also found the Asus ROG Phone offers pretty standard protection against scratches for its 6-inch AMOLED screen. That’s not a bad thing, mind you, as we’re obviously talking about 2018 flagship standards, which means you’ll need to be trying pretty hard to scratch that extra-sharp, low-latency 90 Hz display. Meanwhile, both the single front-facing camera and dual rear shooters are covered by glass, making them invincible to Nelson’s razor blade, which is also the case for the handset’s oddly shaped fingerprint reader on the back. The phone’s top, bottom, sides, and buttons are all made of robust metal, but the unique-looking stereo speaker grills have plastic glued on top of metal, which may prove problematic in the long run. Still, the glue feels quite strong, so it’s highly unlikely that those copper accents will peel away on their own. As for the bend test, which arguably remains the most exciting (and painful to watch) part of these detailed durability inspections, the Asus ROG Phone manages to stay (largely) intact. For some reason, bending the device from the back constantly produces a popping sound, while bending it from the front can yield some minor flex. Nothing big to worry about, though. This is how good the iPhone should be for what it costs. Sadly it's a cheap Chinese made overpriced piece of crap. It is a sad day we live in, when costlier items are of worse quality vs cheaper options. When it comes to fancier cars, yes being made from less resilient materials means they cant stand up to certain things like normal cars and that is an expected exception. But for a phone which cost far less to make the quality should be far and away better the most its costs. Tablets too. The latest iPad bending like tinfoil when no other tablets at a cheaper price has the same low quality, shows you what company's sell garbage at high cost and which ones a totally want you to have a great product experience.